Passed my Class 2A License Test! 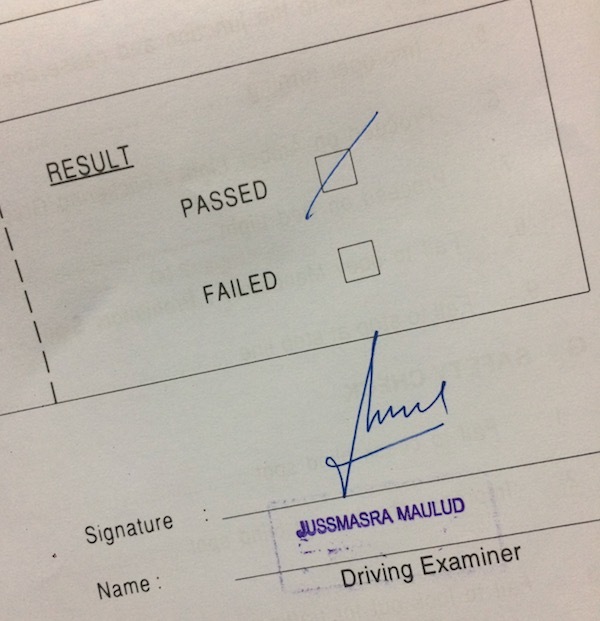 3 practical lessons, 3 weeks, $300, and I finally got my Class 2A driving license! For those who are unfamiliar with the Singapore tiered driving license scheme for motorcycles, (regardless of age and driving experience,) motorcycle learners start off with a Class 2B license which limits the rider on a motorcycle with engine below 200cc. You’ll need to wait ONE YEAR before you can register for lessons for the next tier. Passing the next tier, Class 2A, will allow you to ride a motorcycle of up to 400cc engine capacity. Again, you need to wait for another ONE YEAR before you can register for lessons for the next tier – the coveted Class 2 unlimited cc license. The 100-minute Class 2A theory lesson in BBDC. Overall course structure for Class 2A comprise of a 100-minute theory lesson and 3 practical lessons (including an evaluation session). The practical course structure for Class 2A was largely similar to Class 2B – with the addition of the Bumpy Course. Timings for the Narrow Plank station was also a little bit more challenging (8secs vs 6secs for 2B), and speeds for the Emergency Braking section a little higher (40kmph vs 30kmph). And since I took my Class 2B in BBDC, I was more or less familiar with the circuit. No road lessons for Class 2A as you’re deemed a licensed-rider with road experience. 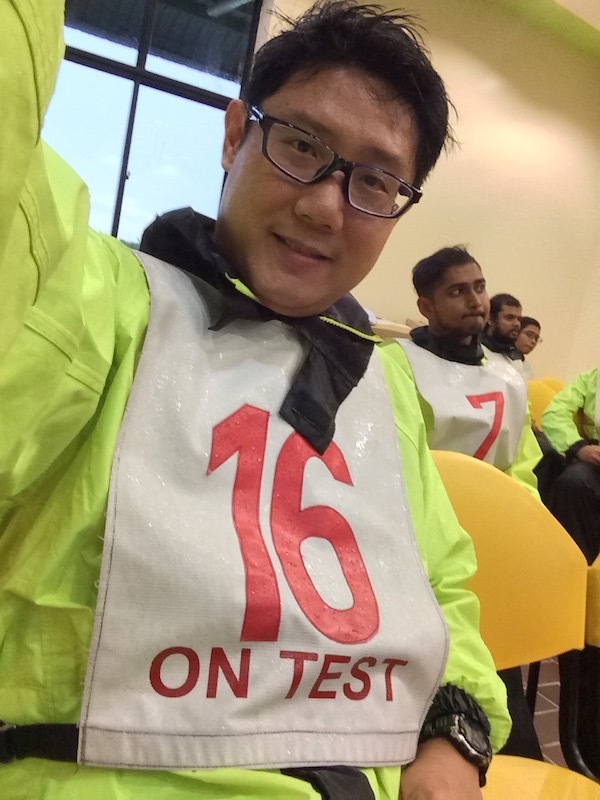 I signed up for the course on the 5th Jan 2017 – exactly 1 year after I obtained my Class 2B license. Cleared the theory lesson (no exam) and all the practical lessons on first attempt, and immediately booked for the nearest available Traffic Police (TP) Test. Thankfully, the wait at BBDC is short – about 2 weeks. CDC has the longest waiting time – approximately 2 months wait! Arrived at BBDC this morning rather dismayed – it was RAINING! Oh gosh! And the sky looked sufficiently dark that we all knew that we would be taking the TP Practical test UNDER THE RAIN! GASP! That’s me waiting for my turn to take the Class 2A license practical test – also known affectionately as the TP Test. We were all dressed in luminous green rainsuits! Thankfully, the warm up practice didn’t turn out too bad for me, although I did witness some practice bikes falling off the narrow plank and the bumpy course – possibly due to the wet weather. I was keeping my fingers crossed that it won’t happen to me – especially during the test proper. Anyway, when I came to the actual test, it felt very much like practice to me. And before I even realised it, I’ve completed the route and the test is over. We then had to wait for everyone to finish their turn and for the examiners to tabulate the results. 11:15am. We all gathered into the classroom and waited for our results. Then, followed by the familiar drill of the instructors calling out the number tags of those who didn’t make it, and these candidates were ushered into the next room for a debrief of their test performance. The ones remained in the room are deemed to have passed the test. Congratulations! Wow that’s less than 1 month to get class 2A. Planning to take mine in March 2017 when my 2B probation is up. Any tips for passing class 2A? Good advice, hope to pass 1st time as well. Ride Safe! Congrats man! So, 400x? Or Super4? Yamaha MT-03 looks quite cool, but a little underpowered. Hahaha… haven’t quite decided yet. Frankly, all things considered, I’m pretty pleased with the Pulsar for now – low maintenance, cheap parts, cheap road tax, cheap insurance, (just about) sufficiently powerful to break any speed limits – even on NSHW, and of course, the familiarity with the bike. So I might just wait a little while longer. Definitely not in a hurry to switch. Congratulation to biding farewell to your beginner’s ‘P’ plate and passing your class 2A. But do remember that because you have just pass your 2A, you are still under probation on all class of license, so you only have 12 points for the next 12 months. Really? I was pretty sure that the 12 points in 12 months only applied to P-plate holders – regardless of Class 3 or 2B. It’s 24 points in 24 months thereafter. Assuming no accumulation of points in the year prior, obtaining a Class 2A and Class 2 license does not revert to 12 point limit. It does. You have 12 points for the next 12 months (ie, get 13 points and you lose your licence). If you go for class 2, you’ll have 12 points for another 12 months. The only good thing is that you don’t need to put on the probation plate. The worst part is that the 12 points applies to ALL your licences. The points are associated with the person, not the licence. If you kenna 13 points, TP can theoretically revoke ALL your licences (class 3, 2B and 2A). But in reality, they usually revoke only 1. So, every time you get a new licence, be extra careful for the next 12 months. Hey, I had the same bib number as you! Jeez… your TP was so fast. Had to wait 2 months for mine! Anyway, congrats to you! I passed mine too (barely). Safe riding! C.O.N.G.R.A.T.U.L.A.T.I.O.N.S.!!! =) It’s doesn’t matter whether you got 18 points or 0 points – it’s that final sticker at the back of the card that matters! Pssssst…. I (barely) made it too! Kekekek. Would like to check with you, for class 2A, your TP test date were all 2A riders? If so, do they make you go out on the road again or just the circuit evaluation? No road test. Just circuit. The class 2A and class 2 riders take the test together – same route. For any kind of practice, you need to sign up as a student in one of the 3 driving centres in Singapore. When doing your 2A, you’ll probably advance a little bit slower than your peers who have taken their 2B lessons in the centre. Not to worry – the instructors will guide you through.